In 1996, Bill Gates titled an essay with three words that soon became a online marketing mantra – “Content is King“. This phrase ushered in the era of content marketing and led to the formation of a multi-billion dollar industry geared towards generating new business. But before we delve too deep into what content marketing is and how it can help your recruiting and staffing company grow, let’s look at where the industry stands today. Like most established industries, the recruitment industry has settled on various models that govern different parts of the business. And when it comes to new client acquisition, there are, broadly speaking, three pillars that are used to drum up new leads: ambulance-chasing, the slow burn and referrals. An ambulance-chaser is constantly on the hunt for new business. He is scouring job boards looking for roles where he already has a suite of good candidates and will happily contact the hiring manager in charge of the position to see if he can offer his assistance. He has no qualms about trying to fill a role that is already under contract to another recruiter because he knows from experience that companies looking to hire tend to not be loyal to their current recruiter. This reactive approach to recruiting can be tiresome but it pays dividends for those who know how to hustle. The slow burn approach is quite the opposite. The slow burn recruiter knows that even though a company may not be hiring today, a growing firm will eventually need more employees. Therefore, she works to establish trusted relationships with HR executives and hiring managers so that when it is time to hire, she will be first in line for the new roles. Her premise is simple: a relationship that has a strong foundation is far more likely to continually pay off than one that is only grounded in serving a pressing need. The final pillar of new client acquisition is referrals. Companies that have an established reputation and develop strong relationships over time through successful placements will naturally have additional business referred to them. Whether it is someone reaching out after they move to a new company or the friend of a hiring manager approaching your firm after hearing about the great work you did, referrals will often form the cornerstone of the client acquisition process for a prosperous recruiting firm. 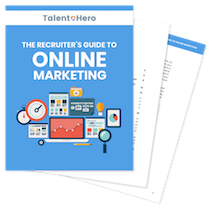 For years, the three pillars above formed the entirety of most recruiters’ lead generation strategy. However, with the advent of the Internet, there is now a fourth pillar that is just waiting to be used by the savvy recruiter – content marketing. Simply put, you create content that offers something of value to your target audience, which includes HR executives and hiring managers. Over time, this audience establishes a relationship with your business by reading and sharing the content. Eventually, a level of trust between you and your readers is formed before you’ve even spoken to a single person at your target company. More importantly, when the time comes to hire a recruiter, you will be the de facto expert in the field and your name will jump to the top of the list. Although the concept of content marketing is far from new, it has not caught on in the recruiting and staffing industry as quickly it has in other sectors. There are two reasons cited by most industry professionals, neither of which are compelling. First, there isn’t enough time to produce content. When a busy person makes this argument, it often makes sense at first glance but on closer examination, it falls apart. Your time should be invested where it has the highest return. There is a good chance that some of the time you spend today on certain tasks has a lower return than a content marketing push. Therefore, it would make sense to reduce your time spent on those tasks, possibly by outsourcing the work, and instead spend it on content marketing. If you are not persuaded that content marketing has a higher return than your other activities, you should at least try it out to see if your hypothesis is correct, especially given the compelling evidence from other industries that it does work. Second, the recruiting and staffing industry is all about hustle. The average recruiter does not last long because recruiting is an industry that causes quick burnout. If you don’t like to cold call, meet with leads and constantly sell, it’s unlikely you will last for more than a couple of years. Therefore, the people who tend to stick around the longest (and end up in decision-making roles) tend be those who can tolerate the grind. By definition, people who grind tend to shy away from activities, such as content marketing, that don’t have an immediate payoff. However, the tendency to avoid long-term marketing strategies is not wise. Much like the argument made in the first point, if content marketing works, you should be doing it even if it runs counter to your instincts. The best business people are those who know how to adapt to an ever-changing landscape and if content marketing is not a part of your lead generation toolset, you will slowly fall further behind your competition.